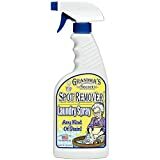 Grandma’s Secret-Laundry Spray: 16 Ounces. Remove any kind of stain, including oil, grease, paint, make-up, grass, clay, inks, blood, tar, coffee, rust, fabric bleed, pet stains and more! This package contains one 16oz spray bottle of laundry spray. Non-toxic. Made in USA.